Crystal Palace exacted some form of revenge for their league defeat to Middlesbrough at the weekend with a deserved Carling Cup success. 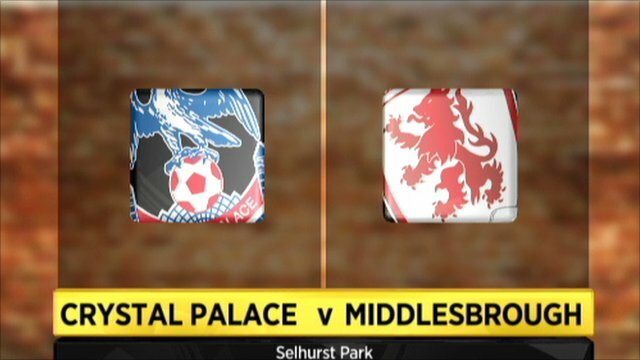 Boro won 1-0 at Selhurst Park on Saturday but Wilfried Zaha and Calvin Andrew struck to see Palace progress. Zaha's fine strike from the edge of the area separated the sides at half-time. Andrew extended the lead early in the second half, and although Merouane Zemmama pulled one back almost straight away, Palace held on. Both sides were much changed from the weekend encounter, but the two still served up an entertaining clash. Despite enjoying the majority of possession in the first half, the visitors failed to muster a single shot on target - and they were made to pay for it in the 18th minute. Teenage winger Zaha, a constant threat for the home side, collected the ball for Palace on the left-hand side of the penalty area before sweeping a shot past Danny Coyne. It was Palace who began the second half the stronger and it was no surprise when they doubled their lead with 52 minutes on the clock. Again Zaha provided the spark for the home team, drifting in a cross which Andrew powerfully headed home from close range. That second Eagles strike shook Middlesbrough into life, and they were brought back into the fixture three minutes later by Zemmama, who took control of the ball inside the Palace penalty area before striking it past Lewis Price. Five of the last six meetings between these two sides at Selhurst Park had finished 1-0, but both sides continued to press for that decisive fourth goal. Boro boss Tony Mowbray introduced an attacking double substitution on 67 minutes, and his side pounded the Palace goal late on. Rhys Williams and Scott McDonald both went close in the final moments, but Dougie Freedman's men held on to advance to the fourth round. 90:00+4:55 The match has reached full-time. 90:00+4:25 Effort on goal by Faris Haroun from outside the box goes harmlessly over the bar. 90:00+3:48 Unfair challenge on Kevin Thomson by Sean Scannell results in a free kick. Indirect free kick taken by Danny Coyne. 90:00+3:24 Indirect free kick taken by Lewis Price. 90:00+3:24 Booking Lewis Price is cautioned by the ref for time wasting. 90:00+2:51 Unfair challenge on Alex Marrow by Alex Nimely results in a free kick. 87:53 Steffen Iversen is ruled offside. Indirect free kick taken by Danny Coyne. 87:22 Scott McDonald takes a shot. Save made by Lewis Price. 86:02 Substitution Sean Scannell joins the action as a substitute, replacing Wilfried Zaha. 86:02 Shot from inside the area by Rhys Williams clears the bar. 84:45 Justin Hoyte produces a cross, Anthony Gardner makes a clearance. 83:09 Unfair challenge on Wilfried Zaha by Faris Haroun results in a free kick. Indirect free kick taken by Stuart O'Keefe, Calvin Andrew takes a shot. Danny Coyne makes a save. 80:57 Stuart O'Keefe challenges Marvin Emnes unfairly and gives away a free kick. Marvin Emnes takes the indirect free kick. 78:56 Calvin Andrew concedes a free kick for a foul on Matthew Bates. Matthew Bates takes the free kick. 78:46 A cross is delivered by Merouane Zemmama, clearance by Peter Ramage. 76:46 Free kick awarded for an unfair challenge on Kevin Thomson by Steffen Iversen. Indirect free kick taken by Matthew Bates. 76:13 Calvin Andrew takes a shot. Save by Danny Coyne. 75:38 Free kick awarded for a foul by Justin Hoyte on Wilfried Zaha. Stuart O'Keefe takes the indirect free kick. 73:09 Substitution (Crystal Palace) makes a substitution, with Steffen Iversen coming on for Glenn Murray. 73:09 The ball is delivered by Rhys Williams. 72:51 Foul by Wilfried Zaha on Faris Haroun, free kick awarded. Faris Haroun takes the free kick. 71:35 The ball is delivered by Glenn Murray, save by Danny Coyne. 69:40 The ball is delivered by Justin Hoyte. 68:12 Foul by Alex Marrow on Kevin Thomson, free kick awarded. Free kick taken by Matthew Bates. 66:29 Substitution Marvin Emnes on for Richard Smallwood. 66:29 Substitution Faris Haroun on for Julio Arca. 65:33 Substitution Peter Ramage on for Jonathan Williams. 65:20 Centre by Jonathan Williams. 64:35 Free kick awarded for a foul by Kevin Thomson on Jonathan Parr. Lewis Price takes the free kick. 63:38 Alex Nimely takes a shot. Save made by Lewis Price. Corner taken by Kevin Thomson from the left by-line. 63:06 Justin Hoyte sends in a cross, clearance by Jonathan Parr. 61:50 The official flags Calvin Andrew offside. Rhys Williams takes the indirect free kick. 60:14 Shot from outside the area by Stuart O'Keefe misses to the left of the target. 57:52 Dean Moxey fouled by Merouane Zemmama, the ref awards a free kick. Free kick taken by Dean Moxey. 56:55 Stuart O'Keefe restarts play with the free kick. 56:55 Booking Julio Arca is given a yellow card. 56:46 Free kick awarded for a foul by Julio Arca on Jonathan Williams. 55:56 Scott McDonald is adjudged to have handled the ball. Lewis Price takes the indirect free kick. 55:34 Unfair challenge on Kevin Thomson by Stuart O'Keefe results in a free kick. Kevin Thomson takes the free kick. 54:02 GOAL - Merouane Zemmama:Crystal Palace 2 - 1 Middlesbrough Merouane Zemmama finds the net with a goal from inside the penalty box to the bottom left corner of the goal. Crystal Palace 2-1 Middlesbrough. 52:58 Julio Arca takes a shot. Lewis Price makes a save. 51:44 Wilfried Zaha provided the assist for the goal. 51:44 GOAL - Calvin Andrew:Crystal Palace 2 - 0 Middlesbrough Calvin Andrew finds the back of the net with a headed goal from close in. Crystal Palace 2-0 Middlesbrough. 50:44 Inswinging corner taken from the left by-line by Wilfried Zaha. 50:20 Glenn Murray takes a shot. Rhys Williams gets a block in. 50:06 The ball is crossed by Dean Moxey. 47:35 Glenn Murray takes a shot. Save by Danny Coyne. 46:04 Dean Moxey produces a cross, Glenn Murray produces a right-footed shot from inside the area that goes over the bar. 45:01 Substitution Tony McMahon goes off and Matthew Bates comes on. 45:00+2:22 The ref blows to signal half-time. 45:00+2:03 Justin Hoyte takes a shot. 45:00+0:57 Inswinging corner taken right-footed by Stuart O'Keefe from the left by-line, clearance made by Justin Hoyte. 45:00+0:28 Corner taken by Stuart O'Keefe from the right by-line, Calvin Andrew takes a shot. Clearance made by Justin Hoyte. 45:00+0:01 Outswinging corner taken from the right by-line by Stuart O'Keefe. 44:54 Wilfried Zaha sends in a cross, Stephen McManus manages to make a clearance. 41:04 Glenn Murray concedes a free kick for a foul on Rhys Williams. 40:58 Free kick taken by Rhys Williams. 40:58 Booking Glenn Murray goes into the book. 38:58 The assistant referee signals for offside against Scott McDonald. Free kick taken by Lewis Price. 37:15 Corner taken right-footed by Stuart O'Keefe. 35:34 Unfair challenge on Wilfried Zaha by Rhys Williams results in a free kick. Indirect free kick taken by Stuart O'Keefe. 35:22 Calvin Andrew takes a shot. Rhys Williams gets a block in. 33:57 Inswinging corner taken by Julio Arca from the right by-line. 33:47 A cross is delivered by Tony McMahon, clearance by Patrick McCarthy. 32:40 Alex Marrow produces a right-footed shot from outside the box and misses left. 31:10 Stuart O'Keefe restarts play with the free kick. 31:10 Booking Tony McMahon goes into the referee's book. 31:03 Wilfried Zaha fouled by Tony McMahon, the ref awards a free kick. 29:56 Scott McDonald is penalised for handball and concedes a free kick. Indirect free kick taken by Lewis Price. 29:40 Calvin Andrew takes a shot. Save by Danny Coyne. 29:09 A cross is delivered by Tony McMahon, Lewis Price makes a comfortable save. 26:22 Effort from inside the six-yard box by Jonathan Parr goes wide right of the target. 25:44 Free kick awarded for an unfair challenge on Danny Coyne by Calvin Andrew. Rhys Williams takes the indirect free kick. 24:24 Unfair challenge on Wilfried Zaha by Julio Arca results in a free kick. Free kick taken by Dean Moxey. 23:37 Effort from deep inside the area by Scott McDonald clears the bar. 23:20 Jonathan Williams takes a shot. Comfortable save by Danny Coyne. 22:09 Scott McDonald decides to take the corner short. 21:28 Patrick McCarthy gives away a free kick for an unfair challenge on Julio Arca. Kevin Thomson restarts play with the free kick. 21:01 Inswinging corner taken from the left by-line by Stuart O'Keefe, Rhys Williams makes a clearance. 20:47 Glenn Murray takes a shot. Blocked by Stephen McManus. 18:42 Free kick awarded for a foul by Jonathan Parr on Merouane Zemmama. Tony McMahon sends in a cross, Stephen McManus produces a header from inside the area that goes over the bar. 17:15 Assist on the goal came from Jonathan Williams. 17:15 GOAL - Wilfried Zaha:Crystal Palace 1 - 0 Middlesbrough Wilfried Zaha finds the back of the net with a goal from inside the penalty area to the top left corner of the goal. Crystal Palace 1-0 Middlesbrough. 15:37 Calvin Andrew takes a shot. Blocked by Stephen McManus. 15:06 Free kick awarded for an unfair challenge on Kevin Thomson by Calvin Andrew. Rhys Williams restarts play with the free kick. 14:28 Shot by Tony McMahon from outside the box goes over the net. 12:19 Patrick McCarthy concedes a free kick for a foul on Justin Hoyte. Danny Coyne takes the free kick. 11:49 Jonathan Williams fouled by Richard Smallwood, the ref awards a free kick. Stuart O'Keefe restarts play with the free kick. 11:34 Free kick awarded for an unfair challenge on Wilfried Zaha by Richard Smallwood. Anthony Gardner takes the free kick. 5:51 Wilfried Zaha takes a shot. Danny Coyne makes a save. 4:09 Merouane Zemmama takes a shot from just inside the penalty box which clears the crossbar. 3:28 Rhys Williams concedes a free kick for a foul on Calvin Andrew. Indirect free kick taken by Stuart O'Keefe. 1:20 Shot by Julio Arca from deep inside the penalty area misses to the right of the goal.